Attending Breakfast on the Bernard on Sat Feb 7 was, left, Tom Ronayne, FOR President, David Linder, Brazoria County Commissioner, Jason McCaffety, Brazoria County Superintendent, and Gary Kersch, Administrative Assistant. Fifty interested people attended breakfast to hear County Commissioner David Linder and Brazoria County Superintendent Jason McCaffety discuss the new 100' long boat ramp, dock and parking area planned for construction at Hanson Riverside County Park scheduled to start sometime in March or April of this year. This project was originally started in 1987. Most of the funds to build the much need ramp will be from government grants. The project will consist of a road coming off of Hwy. 35, a parking lot, ramp access and boat ramp. DIG drainage ditches along the road and parking lot. HAUL in fill dirt for road bed, parking lot and ramp access. STABILIZE the subgrade with lime slurry 6” x 6% “approx. 140 tons = 14 semi-tanker loads"
PUT a prime coat of CSS1 emulsified asphalt for dust control onroad, parking lot and ramp access. Ready for public use !! 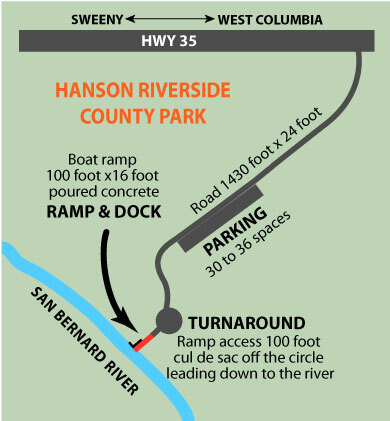 2009 Request permission to move location of boat Ramp to Hanson Riverside County Park. Accepted. 2015 On site pre-bid meeting with contractors, revise specks, drawings posted on Purchasing Dept. website.